This Jackpot Slot Is Hot, Hot, Hot! Blazing Jolly is a new release from Novoline at Novomatic. It’s a 5-reel, 40-payline video slot with a jackpot! The background is lit up like a bonfire and this jolly is certainly blazing. The jolly is actually a jester. Jesters have been entertaining the world’s royalty since the middle ages. The Novomatic jester is certainly jolly, as you can tell by his huge grin! He’s wearing a traditional-style jester costume, complete with multicoloured hat! Jesters clothes were usually decorated in a motley pattern and this jolly is no different. His hat is blue, red and green and has golden bells! You’d hear this jolly jingling whenever he was around. His collar looks like it’s made from golden cloth and it’s laden with jewels, including a sapphire and four rubies. These would most certainly have been a gift from the King! If you win the jackpot in Blacking Jolly, you’ll have enough to buy your own jewels or hire your very own jester. This slot’s jackpot is progressive. It’s forever getting bigger and bigger until someone wins it. It will then grow again very quickly. Blazing Jolly delivers lots of fruity fun. Even beginner slots players will get a lot of fun out of this slot! It’s very simple, colourful and entertaining. All of the rules are clearly outlined on the paytable. The paytable also updates automatically when you adjust your bet, so you’ll always see the pays that are relevant to you and your bet. You can change your bet by altering the number of paylines you’re betting on and how much you’re betting on each of them. The jolly jester is the definitely the happiest symbol in Blazing Jolly. This must be something to do with the fact that he hands out the biggest wins of all the symbols. The other symbols might not be as happy but they’re definitely just as colourful. In descending order of value, you’ll find: the red seven, the bar symbol and then the fruits and the golden bell. The grapes and the watermelon are the most valuable fruit symbols. The cherries, by contrast, are the least valuable symbol. In the middle, there’s the plum, the lemon and the orange. The jolly Novomatic jester and the ripe, red cherries pay for 2, 3, 4, and 5 matches. The rest of the symbols in Blazing Jolly only pay for 3, 4 and 5 matches. 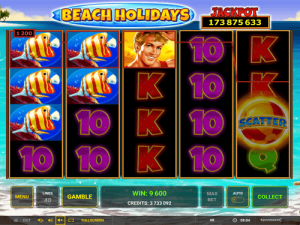 Blazing Jolly isn’t an allplay slot, so paylines count! The maximum number of paylines you can play with is 40. You get to decide how many to play with and how much you want to bet on each payline. A winning combination of symbols includes 2 or more identical symbols (for the cherries and the jolly) or 3 or more identical symbols for the others. For it to award the payout, the combination must follow a payline without any gaps. The paylines go from left to right, which means that the combinations have to start on the leftmost reel and continue across the reels. If there are any gaps, the jolly can step in and act like the missing symbol. Of course, he can only help you get the payout if he falls in a gap! You can win a lot in this game, even if you don’t trigger any bonus features. However, the biggest wins are awarded in the Free Games. You might get your biggest win of all time if you win the jackpot! 3, 4 or 5 jolly jester symbols anywhere on the reels will pay you a big win plus it will pause the game while you play 10 Free Spins! While these free spins are going, there’s a very cool feature that’s active. This is the jolly feature! Every single time a jolly symbol lands on any position in the reels, he will stay there. He’ll grin at you as he occupies that position for the rest of the Free Spins. Every new jolly symbol that lands in a new position will also stay in place, and this will continue to happen until either the Free Spins end or there are no more empty positions! If you fill the entire screen with jolly symbols (so 20 of them in all) – the game will pay you the massive, progressive jackpot!